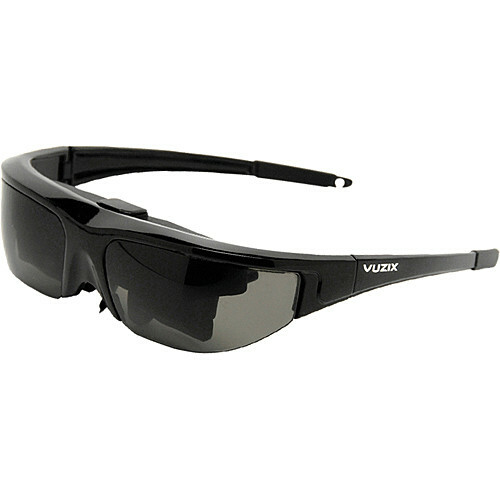 The Vuzix Wrap 920 Video Eyewear is a sunglass-style set of glasses with a virtual 67" display screen as seen from ten feet away. It displays crystal clear 2D and 3D video, which means you'll be able to watch all the latest movie releases, as they were meant to be seen. Plus, the Wrap 920 glasses are perfect for traveling by car, plane, train and boat. The Wrap 920 glasses also connect to all NTSC or PAL audio/video devices with video-out capabilities and composite video connections. There's even an included Composite A/V Adapter for hooking-up your iPod or iPhone. Vuzix also offers optional Wrap Adapters for connecting to HDMI equipped devices and even your desktop PC or laptop for watching movies. Box Dimensions (LxWxH) 6.9 x 6.2 x 2.5"